Junior Boy's Own, Wax Trax! "Born Slippy .NUXX" is a song by British electronic group Underworld. It was released in July 1996 as a single and preceded in January 1995 by a release of the similarly named but completely different track "Born Slippy", which featured "Born Slippy .NUXX" as a B-side. "Born Slippy .NUXX" was released as a single in its own right in the wake of the 1996 Danny Boyle film Trainspotting, where it could be heard in the final scene. The film stoked immense public interest in the track, helping the single peak at number 2 on the UK Singles Chart in July 1996. The Trainspotting soundtrack album credits the track as "Born Slippy", only in the inner liner notes listing it as "Born Slippy (NUXX)". The track has since appeared on many compilation albums and mashup records, and has been remixed. It has been played at nearly every Underworld live performance since 1996. In 2004, it was voted the 4th best dance track ever by readers of Mixmag magazine. In 2014, NME named it the 261st greatest song of all time. Pitchfork Media named it the 31st best track of the 1990s. The Guardian called it, alongside the Chemical Brothers' "Setting Sun", the "most experimental and sonically extreme hit [single] of the 90s." The newspaper also named it among "the weirdest chart [hits] of all time." The band has said that the pounding, relentless rhythm and shouted lyrics of the track were originally meant "as a joke", and the single received little attention. They have also said in a The Guardian interview that the song is intended to sound like an alcoholic's internal dialogue and that Karl Hyde was an alcoholic at the time. Underworld have claimed that the ".NUXX" name was inspired by a computer fault that added that filename extension to the name of their working files. As the original version of "Born Slippy .NUXX" was released on the "Born Slippy" single from the previous year, all copies of this single feature either an edited mix, an extended mix, or both. 2xCD: Junior Boy's Own / Logic / BMG Ariola / 74321-39599-2 (Germany) This refers to the cardboard double pack. 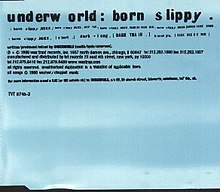 (2003) "Born Slippy .NUXX 2003"
"Born Slippy .NUXX 2003" is a version of "Born Slippy .NUXX" re-released by Underworld to promote the album 1992–2002, originally released in 2003. New remixes were commissioned for this release, along with a new video, compiled by Danny Boyle of clips from his film Trainspotting. The 2003 version of ".NUXX" eschews the synth melody and replaces it with a new piano part, with a chord progression that is present throughout the song, rather than at key moments, like in the original version. The finale of the full length 12" version features additional, rapidly arpeggiating piano and keyboard harmonies intersecting as the drum beat eventually fades away. One of the mixes of the track is extensively used by TV Asahi for their station opening sequence. Two digital singles were also released online. ^ a b Petridis, Alexis (14 February 2004). "The rebirth of art rock". the Guardian. ^ "Chart Log UK". Retrieved 2008-06-21. ^ "What is the greatest dance track of all time?". ^ "Rocklist.net....NME The 500 Greatest Songs Of All Time.. 2014". www.rocklistmusic.co.uk. ^ "The Top 200 Tracks of the 1990s: 50-21 - Pitchfork". pitchfork.com. ^ Lester, Paul (11 July 2008). "What's the weirdest chart hit of all time?". The Guardian. Retrieved 5 May 2017. ^ "Techno.de - Domain(s) for sale / zu verkaufen..." www.techno.de. ^ Lynskey, Dorian (24 February 2006). "Born Slippy was a greyhound we bet on". The Guardian. London. Retrieved 26 April 2010. ^ "Australian-charts.com – Underworld – Born Slippy". ARIA Top 50 Singles. ^ "Austriancharts.at – Underworld – Born Slippy" (in German). Ö3 Austria Top 40. ^ "Ultratop.be – Underworld – Born Slippy" (in Dutch). Ultratop 50. ^ "Ultratop.be – Underworld – Born Slippy" (in French). Ultratop 50. ^ "Top RPM Dance/Urban: Issue 9726." RPM. Library and Archives Canada. Retrieved 25 November 2018. ^ "Underworld: Born Slippy" (in Finnish). Musiikkituottajat – IFPI Finland. ^ "Offiziellecharts.de – Underworld – Born Slippy". GfK Entertainment Charts. Retrieved 25 November 2018. ^ "The Irish Charts – Search Results – Born Slippy". Irish Singles Chart. ^ a b "I singoli più venduti del 1996". Hit Parade Italia (in Italian). Retrieved 27 March 2019. ^ "Nederlandse Top 40 – week 36, 1996" (in Dutch). Dutch Top 40 Retrieved 25 November 2018. ^ "Dutchcharts.nl – Underworld – Born Slippy" (in Dutch). Single Top 100. Retrieved 25 November 2018. ^ "Swedishcharts.com – Underworld – Born Slippy". Singles Top 100. ^ "Underworld Chart History (Dance Club Songs)". Billboard. Retrieved 13 May 2018. ^ "Jaaroverzichten 1996" (in Dutch). Ultratop. Retrieved 27 March 2019. ^ "Rapports annuels 1996" (in French). Ultratop. Retrieved 27 March 2019. ^ "Top 100 Singles - Jahrescharts 1996" (in German). GfK Entertainment. Retrieved 27 March 2019. ^ "Top 100 Singles 1996". Music Week. 18 January 1997. p. 25. ^ "British single certifications – Underworld – Born Slippy". British Phonographic Industry. Retrieved 27 March 2019. Select singles in the Format field. Select Gold in the Certification field. Type Born Slippy in the "Search BPI Awards" field and then press Enter.